This addon shows bosses in public and standard delve dungeons only. Group dungeons aren't added because of the way achievements work on veteran dungeons. In the settings you can enable showing both killed and not yet killed bosses. With the default setting all already killed bosses have a green icon, bosses you haven't killed yet have a red icon. Current version has english, german, french and russian translations. 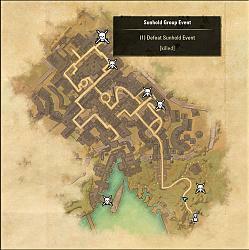 Slash command /dc_mypos prints coordinates of your current location to the chat. 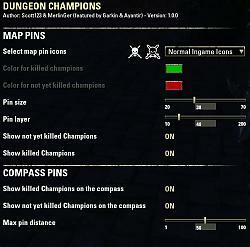 This Addon was developed on the base of MerlinGer Public Dungeon Champions and Ayantir, Garkin's SkyShards addon. - Fixed up the boss location showing up in the wrong dungeons in Murkmire. (Thanks to AssemblerManiac from the Skyshard Plugin). - Added Goldcoast (Dark Brother Hood) delves. - Fixed up some boss locations. Thanks so much for this add on! I was stuck trying to get the last boss in the Hall of the Dead. I killed some of them three times! But I could not get the Hall of the Dead Conqueror achievement for killing all the bosses. Which one was I missing?! I searched ESOUI for help and even though Dungeon Champions is pre-Wrathstone it worked great! I was missing Hrerik Lodorrsbane who is lying down in an open coffin on a dais - that's why I was missing him. Anyway, your little gem fixed it and many thanks for your efforts! Can we get an update please? It doesn't seem to be compatible with the latest client. Could be I am doing something wrong. Anyone else able to still use it? 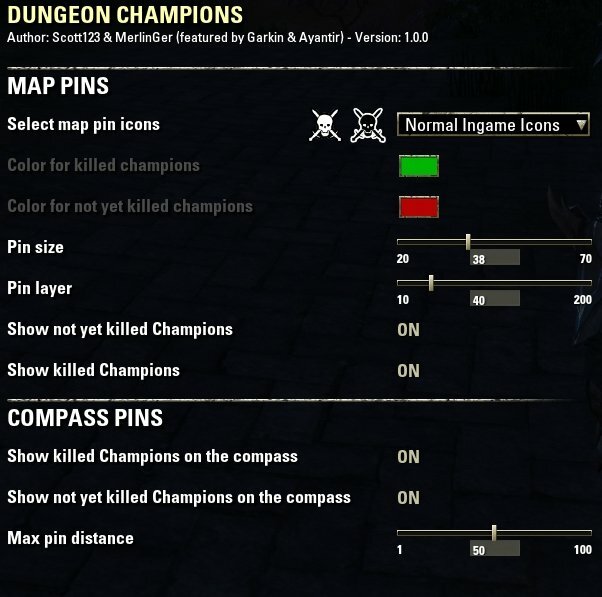 Just wanted to drop by and remark on how useful this addon is, particularly on new characters and especially for achievement hunting in public dungeons. Great job, and thanks! Just downloaded as i'm new to eso and almost missed a dungeon boss. It's not just public dungeons, it does have standard delve bosses as well. There is still some bosses I have missed, which I need to add. Last edited by kindredspirit : 05/31/18 at 04:34 PM. It's not obvious on the description, but this is for Public Dungeons, not Group Dungeons. So I downloaded it. Got in-game and set my settings to red and green bosses. Got into Darkshade Caverns and the addon didn't work. No boss icons showed on the map. I have the compass show option turned off. I double checked my settings and everything looks good so I don't know why it failed to show boss locations. Update: So I uninstalled it. Deleted the saved variables. Re-installed. Ran Crypt of Hearts and still didn't work. Last edited by kindredspirit : 05/31/18 at 10:48 AM.